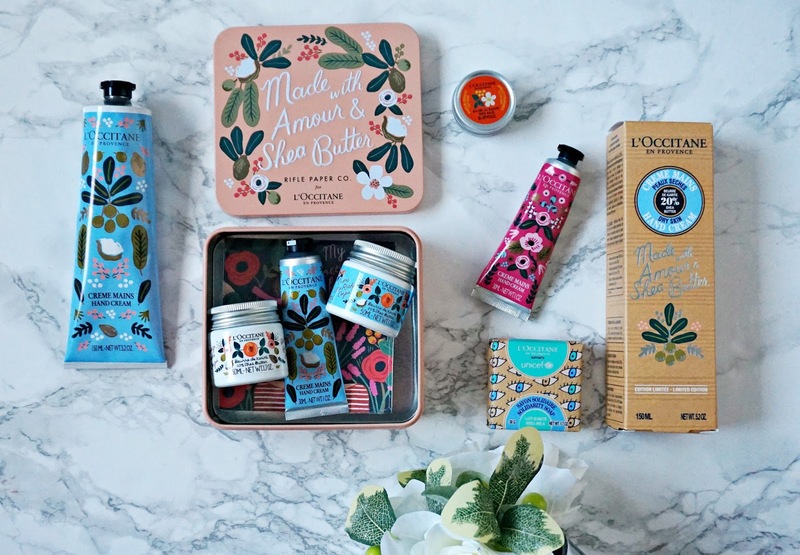 Rifle Paper Co use nature-inspired, floral patterned print illustrations in all of their stationery products and staying true to their style, they have produced packaging inspired by the gardens of Provence, where L'Occitane was founded. Shea Butter hand cream is one of L'Occitane's best selling products so that was an obvious choice for the limited edition packaging. They did a fantastic job with nuts, leaves and shea blossoms in the illustration and on the box it says that the hand cream was made with "Amour and Shea Butter" - isn't everything better when it's made with love? This is an intensely nourishing hand cream but it isn't at all greasy. There are two sizes available - 150ml for €23 or 30ml for €10.50. The rose hand cream is also available in limited edition packaging in a 30ml size. L'Occitane's best-selling multi-purpose balms have also been given the Rifle Paper Co. treatment and I was kindly sent the Apricot scented balm, which is a handbag essential as it can be used on the lips, cuticles and anywhere with dry skin for on the go moisturising. My favourite product from the range is the Shea Winter Rescue Tin, which contains three travel sized products and a set of postcards, all in a reusable Rifle Paper Co tin. There is a 30ml Shea Hand Cream, a 50ml Rich Body Scrub and a 50ml Ultra Rich Body Cream - all perfect for travelling or just to get to know the products. I think this would make a lovely gift for a loved one or for yourself! These limited edition products are available online now and in stores from Jan 18th. Now on to how you can help to prevent childhood blindness. L'Occitane is committed to preserving vision and they have had braille on their packaging for the past 20 years. Every year, they sell a new solidarity product whose profits are used to fight avoidable blindness. They have partnered with Unicef to do this and have helped approximately 400,000 children and they want to reach even more. In 2018, the solidarity product is a 50g bar of soap, the packaging of which was designed by a 9 year old. It is priced at €5 and each bar of soap sold will provide 1 year of Vitamin A for 3 children (visual impairment can be prevented with sufficient Vitamin A). This is a tangible but easy way to make a huge difference to a child's life and it won't break the bank so I urge you all to buy a bar of soap and every time you use it, think of the fact that you will have helped 3 children to see. I know that this is the only soap that will be at the sinks in my house this year. Will you be buying anything with the Rifle Paper Co packaging or the soap? I'd love to hear!